Towards the end of Hugh Leonard’s life he expressed the view that Summer was his best play. This article notes what he and some critics have said about it. The illustration accompanying this article is, I believe, from the 1980 off-Broadway production at the Hudson Guild Theatre. The New York Times critic Frank Rich wrote of this scene : “the lights come up on a grassy hill high above Dublin, and we find eight people relaxing after a picnic lunch, reclining in the sod, saying nothing. It’s obvious that these people all belong to the same part, but, for this extended instant, each character is isolated, staring off into a lonely space of his own choosing… And while no one has spoken a line, the audience has already been treated to a poignant foreboding of the evening’s subject. The tranquil hush of the hill, the beatific stares on the faces, the translucent glow of the sky all summon up an utter stillness that cannot be confused with anything but death”. Summer was first produced at the Olney (Maryland) Theatre in 1974 and staged again in that year’s Dublin Theatre Festival. It was produced off-Broadway in 1980 at the Hudson Guild Theatre with a cast that included Swoosie Kurtz, Pauline Flanagan and Mia Dillon. 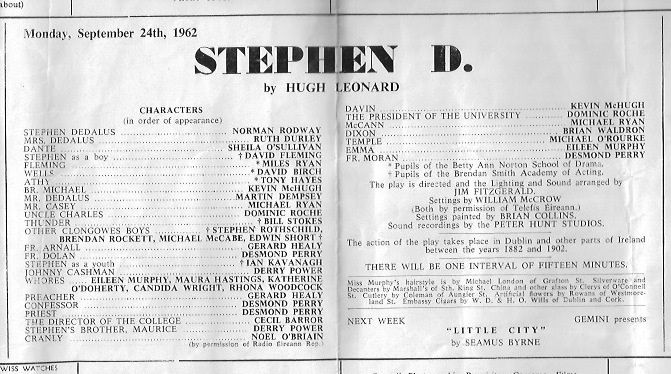 A rehearsed reading was staged at the New Theatre in Dublin in 2007 as part of the Dublin Theatre Festival 50th anniversary programme.